PC - Leisure Suit Larry: Love For Sail! Wii - Wario Land: Shake It! As of tonight, with George s's submission of Brave Prove (J) maps, VGMaps.com now has over 20,000 maps! That's a lot of maps...discuss this milestone here...also, lots of map stats! PC - Isle Of The Dead, Leisure Suit Larry 3: Passionate Patti In Pursuit Of The Pulsating Pectorals! Super NES - Dragon Quest V (J), Lufia & The Fortress Of Doom, Star Trek: The Next Generation - "Future's Past"
Ten years ago today, VGMaps.com was launched! I have a recap of how VGMaps came to be. How long have you visited here? Sound off here. Remember when I spoke out against Flip Industries because of the "Super Kid Icarus" game? Now artists on deviantART and elsewhere are finding their artwork being used by Flip Industries on their web site without permission. Read my update on the Flip Industries situation. Hooray, the "Super NES Game Atlas" project is now complete! 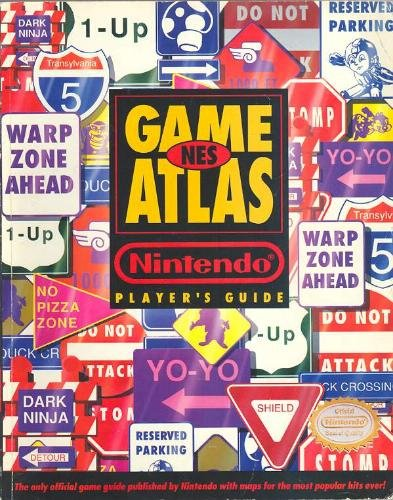 For those of you not familiar, the original "NES Game Atlas" is a book by Nintendo Power, actually the very first of their Player's Guide series, and one of the few early ones that dealt with multiple games instead of a single game. We long ago tackled the recreation of the NES Game Atlas by mapping all the games featured in that, and our "Super NES Game Atlas" project sought to map out those same series as they continued on into 16 bits. So, VGMaps.com can now truly claim to be your source for Mario, Zelda, Mega Man, Ninja Gaiden, Teenage Mutant Ninja Turtles, and Castlevania games on both the NES and the Super NES! GCN - Mario Kart: Double Dash!! Super NES - Final Fantasy VI, Star Trek: The Next Generation - "Future's Past"
You may have seen the "Super Kid Icarus" Flash game by Flip Industries that's been making the rounds last week. Remember back in 2007 when I did those same maps, as the April Fools' joke that year? Unfortunately, Flip Industries has declined to comment on why their game looks so similar to my maps, so I decided to explain my thoughts here. Be sure to join the discussion and tell us what you think!